Allow us to introduce you to Fennel, the perennial plant classified as a member of the carrot family. Everyone treats fennel as a whole vegetable— but we’re here to show you that this bulb is so much more than that. For starters it’s also one of the key ingredients in absinthe! Fennel is similar to celery in that we can use every part of the plant in both culinary and medicinal purposes. Each part offers a different spectrum of flavours and qualities. Let’s get into it by breaking the plant down into its different parts. We’ll go over a brief history of the herb, and some different ways to cook each part. Next time you see one of these at your local market, we hope you pick some up to try for yourself. Its one of the most versatile plants we have. There really is something in it for everyone. The history of fennel goes as far back as the middle ages. Being a perennial herb it was easily grown in the Mediterranean where warriors ate it in hopes of gaining extra strength. The women ate it in hopes of staying thin. The Greek name for fennel is ‘marathon’ which means “grow thin”. It was so widely consumed as an appetite suppressant that during the great European famine in the 1200s, mothers would give the dried seeds to their children to help make them feel better and calm the hunger pains. The seeds have since grown to become one of the most popular spices in middle eastern and Asian cuisines. The easiest way to conquer this intimidating bulb is to view it in two ways; raw and cooked. Both ways are enjoyable and bring out a completely different array of flavours. 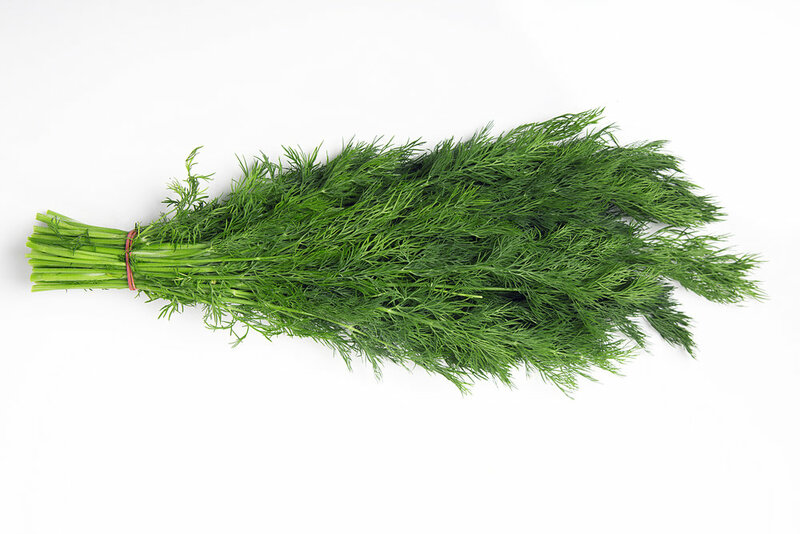 Playing with raw fennel is like using a more flavourful version of celery. The white crisp layers can be pulled apart and shaved paper thin to bring out the anise flavours. This also helps make sure it's not too intrusive in your salad. If you plan to add it to a salad, I highly suggest investing in a mandoline, it will save time on the slicing- just be sure not to catch your fingers in it! Keep the shaved bulb in a lemon-water mixture and covered with a damp paper towel to save it from turning brown and losing its crunchy texture. Now let’s talk about cooking the fennel heads. The most common way to prepare them is by braising. The low and slow cooking process allows the sugars to nearly caramelize and the bulbs become tender and soft with a faint anise taste. Depending on what you cook the bulbs with, it's possible for them to pick up hints of meat and other spices. Braising in red wine with lamb or beef is a sure way to impress any dinner guest, even the fussiest ones. When choosing a fennel bulb from your local market or store, ensure that it’s in season. This way you can make sure you’re getting the best flavour for your buck. Since the bulbs grow underground they can be sensitive to light. When shopping for fennel bulbs make sure that your bulb is white in colour, small to medium size, and have no bruising or discoloured spots. Fennel seeds come two ways, either dried or in powdered form. When selecting your dried seeds, you want them to be a lighter brown colour with a slight green tint to them; this ensures that they're newer and will last longer and have a more potent flavour. The best way to use the seeds for any recipe that calls for them (whole or ground), is to add the required amount of seeds to a warm pan and continually swirl until they have darkened in colour and become aromatic. From there, you can either hand grind with a mortar and pestle or an electric grinder. The best way to store the seeds is in a dark cupboard with an airtight seal. If stored in this way they should last up to 6 months. Both of these items are severely underused in the culinary arts. The stalks can be oven dried overnight and then grilled with fish or other seafood to infuse the licorice flavour into the tender flesh. The fronds can be picked and used in salads, as a garnish, or chopped and used as you would any other herb. The stalks should be a bright green and stand up rigid when picked up. The fronds should be free from discolouration and have a strong aroma. Since this vegetable/herb can be broken down into different parts, the number of uses and pairings are extensive. You can also steam the entire plant and serve it as a side dish if you’re feeling lazy. There are actually a lot of health benefits offered by fennel as well. Fennel is classified as a carminative, appetite suppressant, antispasmodic, nootropic, and digestive tonic. A carminative is any substance that eliminates uncomfortable gas and bloating. Most carminatives, like fennel, have a high essential oil content. This is also the part of the plant that gives the characteristic flavour and aroma. This action is especially useful after a meal with lots of fiber, protein, or fatty foods. Basically anything that has a tendency to promote gas/bloating after the meal. The essential oil of fennel has been shown to regulate the movement of the muscles lining the small intestine . This effectively relieves frustrating intestinal gas. A recent study looked at the memory enhancing effects of fennel as suggested through traditional uses of the plant. The study found that an extract made from the whole plant inhibited the effects of an enxyme known as acetylcholinesterase . Acetylcholinesterase is used to break down the important neurotransmitter acetylcholine. This neurotransmitter is used during memory formation and retrieval. This is one of the most common mechanisms nootropic compounds use for boosting cognitive function and is one of the primary targets of Alzheimer's Disease medications. One of fennels most important uses amongst herbalists is through its ability to give the digestive juices a boost. Good digestion doesn't just rely on the small intestines. It uses the expertise of a few different organ systems. Digestion relies on enzyme secretions in the mouth, stomach, pancreas, small intestines, and liver. It works like a waterfall, starting with the stomach and moving down through the flanks, each stage gaining more momentum. The stomach acid helps to begin breaking apart the food, which then triggers the release of pancreatic and liver enzymes. If stomach acid isn’t strong enough, we can experience sluggish digestive juices all the way through the rest of the digestive tract. Fennel stops this by boosting digestive enzyme secretions in the stomach, pancreas, and liver . This makes fennel especially useful as a herb in cooking because it directly helps us digest the food as we eat it. 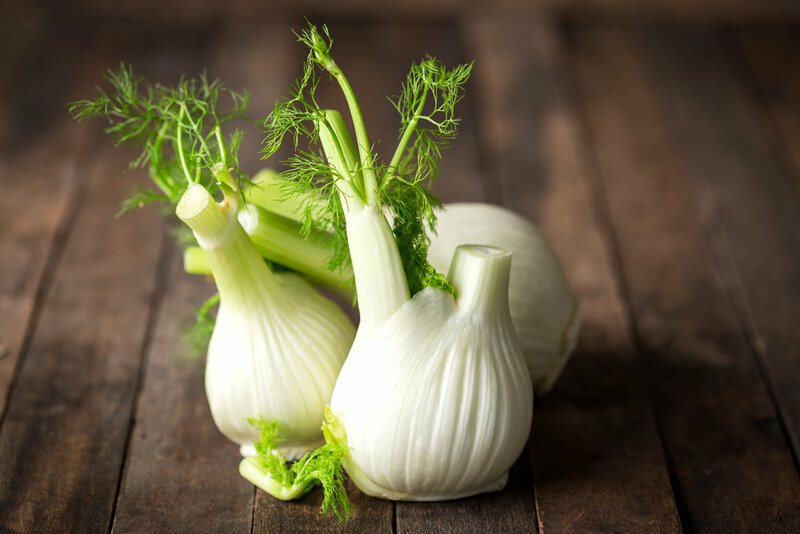 Therapeutically, the dose of fennel is about 5-10 grams per day. This is the dose that herbalists and naturopaths use to treat conditions like poor digestion, IBS, Crohn's disease, and muscle aches & spasms. Most herbalists will use fennel as a liquid extract for this, but this dose can also be obtained through cooking. When cooking with fennel, the amount you use can vary a lot depending on the dish, and your individual preference. If you aren’t sure how strong the anise flavour is, try a piece raw before cooking with it. The bulb, stalk and fronds will all have a different degree of flavour so use your instincts as to how much you wish to use. 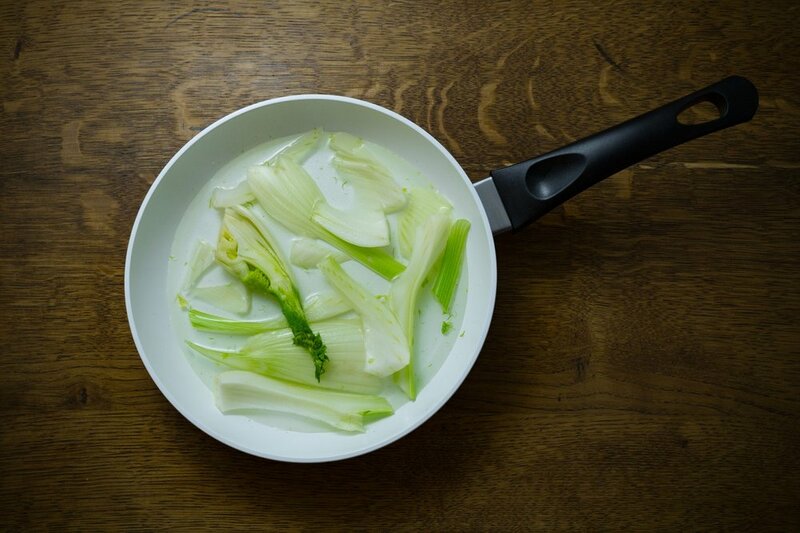 If you’re just starting out with adding fennel into your diet, we recommend starting by eating it cooked to help lower the intensity of flavours and allows an easy integration into your recipes. Place the sliced cucumbers in a sieve and salt them. Allow them to sit and drain for an hour. Gently squeeze out extra moisture. Heat the sesame oil in a small pan over medium heat. When the oil is hot, add the red pepper flakes. Stir and remove from heat. Place the cucumbers and fennel in a bowl. Add the vinaigrette and toss gently. Cover and place in the refrigerator and chill, allow a minimum of 20 minutes for flavours to marry. In a medium saucepan over high heat, bring the vinegar, water, sugar, salt, fennel seeds, red pepper flakes, lemon peel and bay leaf to a boil. Reduce heat and simmer for 5 minutes. Turn off heat and add lemon slices. 3. Braised Fennel With Butter & Parmesan. Melt butter in a oven-safe dish. Place fennel in butter, cut side down and scatter the trimmings around. Season with salt and pepper and increase heat to brown fennel. TIP: Avoid over salting the fennel if using salted butter. Remember that parmesan is also a salty cheese. You can always adjust seasonings after. Add vermouth and cover loosely with tinfoil and lid. Place in oven and cook for 40-50 minutes or until tender. Flipping fennel halfway through. Once fully cooked, remove from dish and cover with tinfoil to keep warm. Turn oven to broil. Return cooked fennel to an oven-proof dish and pour sauce over and sprinkle with remaining cheese. Place in oven until golden brown and sauce is bubbling. Heat a dry pan over medium heat and toast the fennel seeds. Swirl continually to ensure they don’t burn. Cut off the fronds and stalks. Slice the fennel in half and remove the core. Slice the bulb halves remaining thinly. Using a heavy skillet, add the butter and olive oil. Heat over medium-high heat until the butter is melted. Add the raw fennel and a pinch of kosher salt. Cook the fennel for 10 minutes until it begins to brown. Reduce heat to low and continue to cook until caramelized. Remove from the pan and roughly chop. In a heavy bottom pan, heat some olive oil over medium-high heat. When the oil is shimmering, add in the sausage patties. Cover the pan. Cook for 4-5 minutes. Flip the patties and return cover. Cook for another 4-5 minutes or until cooked through. Stuff the cavity with half of the fennel, lemon and basil. Scatter the remaining along with olives in a baking dish and place fish on top. Drizzle fish with olive oil and bake for 30 minutes or until desired doneness. Fennel is a well-rounded culinary herb with medicinal benefits. It’s adds a unique flavour to the dish, which can be dialed in to be as intense or subtle as you want depending on what part of the plant you use, and how much. Fennel is great with heavy meals for its ability to help us digest and eases abdominal discomfort associated with gas and bloating. It also enhances memory, suppresses the appetite, and helps the muscles relax. Fennel just may be the perfect culinary herb. Katy is one of the minds behind the creative blog outlet Kitty Gang, and a damn good chef. Comment below if you want to see more articles like this in the future.